Detroit's premier site for top of the line gourmet dip mixes including olive oil blends and dessert mixes! We use the finest ingredients and work with local resources to support our community. The Detroit Dip Company was founded in 2018 in Detroit, Michigan. Our company produces and supplies herbs, seasonings, and spices in the form of dry dip mix for retail and commercial markets. A portion of every dip mix sold goes to local charities under our "Dipping for a Difference" program. The Detroit Dip Company was founded by a mother, who bought some dip mixes from a local fair and after getting home and reading the label, she realized they were full of poor ingredients like Dextrose and MSG. Upon noticing this she knew she could do better. After a long research and development process, The Detroit Dip Company was born. Focusing on a small menu with quality ingredients, we don’t settle for anything less than all natural. If we can’t find all-natural ingredients for a specific blend, we don’t make it. We’re not like our competitors who often carefully navigate the guidelines to barely pass for what can be called ‘All Natural’. Simply put, when we say ‘All Natural’ , you can be assured that’s what you’re getting. One mom’s “I can do better!” attitude started off as a hobby, which quickly turned into a passion, and is now a business. We want to thank WXYZ-TV Channel 7 Detroit and Fox 2 Detroit for featuring us on their morning program and allowing us to talk about our amazing all natural dips and our Dipping for a Difference program!! At The Detroit Dip Company, we’re committed to giving back and making a difference in the lives around us. That’s why we go out of our way to support community organizations in the Detroit area through our "Dipping for a Difference Program". We’re dedicated to playing an active role in the neighborhoods where we work and live. We like to give all good causes a chance to be selected to receive a portion of our proceeds so charities that would like to be considered should send us an email TheDetroitDipCo@yahoo.com. All Michigan charities are eligible. Submissions should include a brief description of the charities background and a registered tax ID. We look forward to making a difference in Detroit one dip at a time! All of our recipes are developed in Detroit, using quality ingredients inspired by the surrounding communities. Our savory dips blend well with sour cream, REAL mayonnaise and cream cheese, one pouch yields 16 ounces of dip, individual dip instructions listed on each pouch. 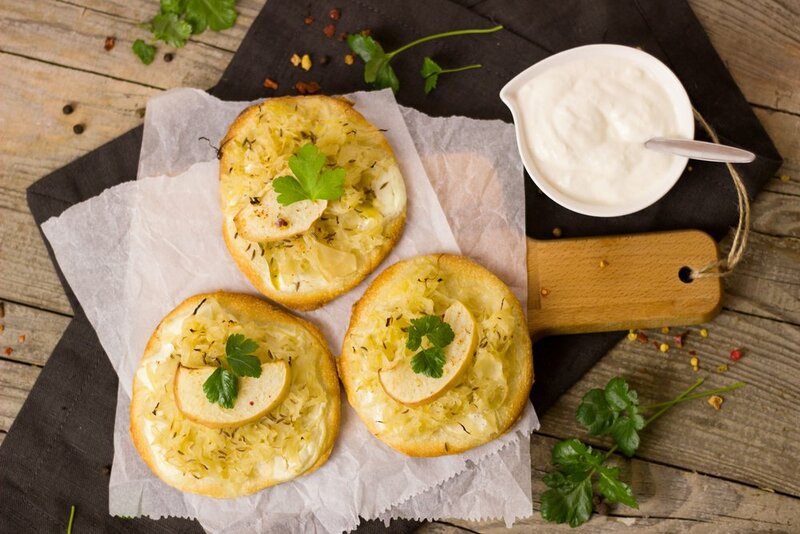 Our dips can also be made with Greek or plain yogurt for a lower calorie option! They also make great dry rubs for fish, chicken or steak! Take a trip from 'The D' to 'The Big Easy' with our New Orleans inspired cajun dip. A wonderful dill veggie dip that's perfect for salmon or mixed into egg salad! An upscale twist on vegetable dip that will even get your kids to eat their broccoli! This dip was inspired by one of Detroit's most vibrant communities. Served either hot or cold, add cheese or your favorite meat to really take this dip to a new level. 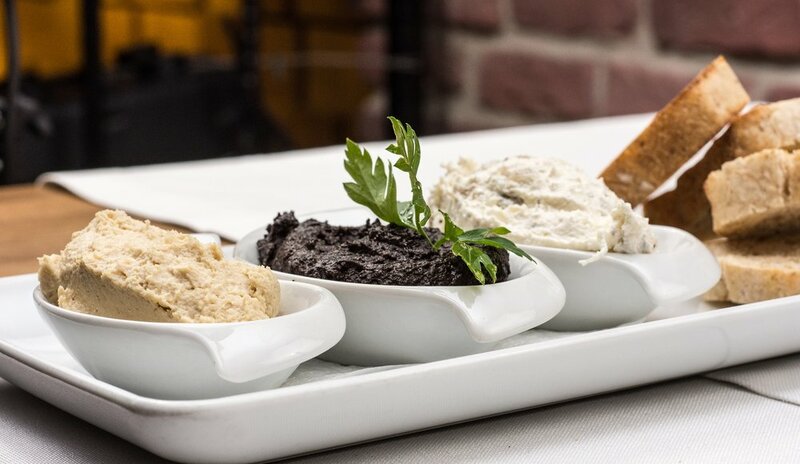 Our Italian inspired dip that perfectly accompanies any bread platter. Just add your favorite olive oil and "forget about it!" Great as a marinade, a dressing and of course a great addition to your favorite loaf of bread. Ingredients: Crushed Red Pepper, Black Pepper, Garlic, Italian Spice Blend, Parsley, Balsamic. Bracci Blend requires just one cup of regular olive oil mixed with 1 tablespoon of the blend, each pouch has 5 servings! Our take on a traditional onion dip. The perfect accompaniment for potato chips. This dip hustles harder. Our jalapeño cheddar is full of HEAT and flavor! Serve it HOT or COLD and get ready for it to disappear at your next party! Don't think we forgot your sweet tooth! These blends perfect just as dips or also as cheesecakes or mousse pies! Our special seasonal dip that is a sure bet to be a hit at any holiday party. It's a seasonal special so don't miss out! Have a sweet tooth but can't decide between chocolate, vanilla, or strawberry? There's no need to pick favorites with this dip. A wonderful blend of all your favorites that goes great with fruit or turned into a mousse pie with an Oreo crust! Our dips may be the secret ingredient you’re missing to bring your recipes to the next level. We had the privilege of showing off three of our favorite recipes on WXYZ-TV Detroit Channel 7: Snowman Cheeseballs, Smoked Salmon Crostini, and our Merry Mint Mousse. To view these recipes and more please visit our ‘Recipes’ tab at the top of the screen. The Detroit Dip Company is pleased to announce our Favors Collection! Do you have an upcoming wedding, bridal or baby shower? Or do you just want to spoil your loved ones at an event soon? If so we have the perfect favor for you… PERSONALIZED DIP BLENDS! 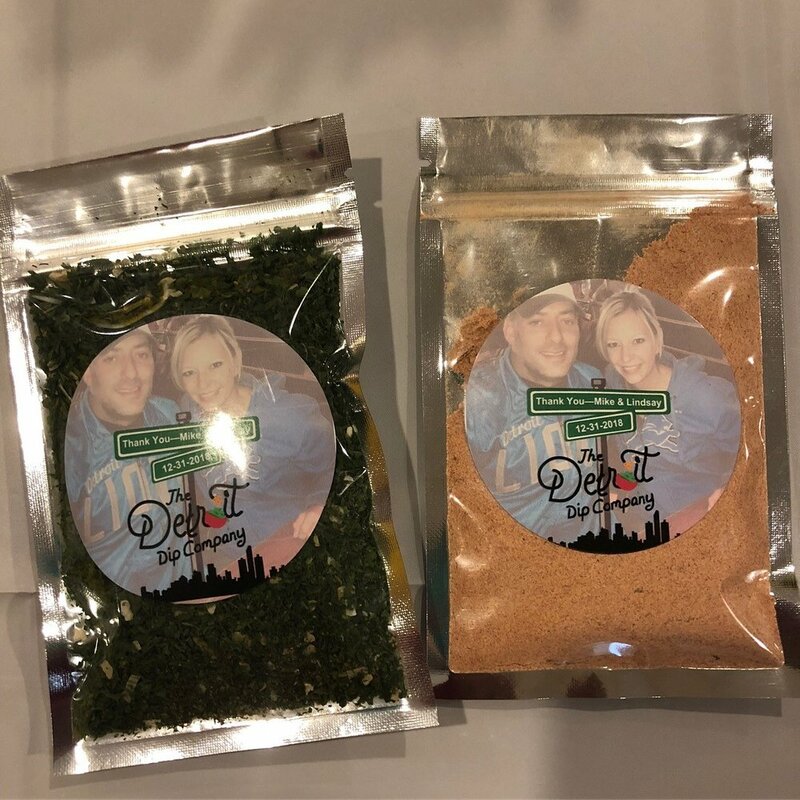 Pick one of our signature dip flavors and we will create a personalized pouch with a custom label featuring your name, date, signature colors AND a catchy slogan think “Megan and Mark The Perfect Blend!” bulk orders are also discounted to meet your budget! Email us today to help you stand out at your next event! To contact The Detroit Dip Company feel free to call us or fill out the form below.